Each home has their own way of preparing ugadi pachadi. Soak the tamarind in 1 1/2 cups of water for 1-2 hours and extract the pulp. Grate the jaggery or you can powder it in a mixer. Separate the neem flowers from the springs. Then gently rub the neem flowers between your two palms to separate the petals and put them in a plate. Use only petals for this process. Keep finely chopped coconut, finely chopped bananas, finely chopped sugarcane and finely chopped peeled mangoes to a side. Take a wide bowl. Add tamarind extract and 2 1/2 cups of grated jaggery. Mix well using your hand till the jaggery melts. Then add the finely chopped ingredients mentioned in step four and mix well. Lastly add neem petals, salt, red chilli powder, black pepper powder. Mix well. Offer ugadi pachadi as naivedyam (offerings to god during the festival of ugadi). Ugadi pachadi should be like a sauce. Do not taste it if you intend to offer it to god. The recipe for ugadi pachadi may vary according to family beliefs and customs. All the ingredients in this pachadi recipe can be adjusted to suite your taste. Ugadhi pachadi goes well with curd rice. An easy, delicious and authentic traditional south indian breakfast recipe. Heat oil in a pan, add moong dal and fry for 1 minute. Add cumin seeds, mustard seeds and stir them for a few seconds. Add finely chopped ginger, green chillies, sliced onions and curry leaves. Cook on a medium flame until the onions become transparent. Add rice rava and salt. Mix well. Pour water and mix well. Check out the salt and bring it to a boil. Now reduce heat, cook on low flame until rava is cooked well. If you think the rice rava needs to be cooked some more, add 1 to 2 tbsp of water. Cover and cook on low flame for 2 to 3 minutes. Once this water is absorbed and the rava is cooked, turn off the flame. Keep covered for 2 to 3 minutes. Serve hot. Adding a tea spoon of ghee while boiling water enhances the flavour but it is optional. Rinse the methi leaves well. Drain them completely. Chop the methi leaves finely and keep it aside. Mash green chillies and garlic to a fine paste in a motor pestle. Take a bowl, add methi leaves and green chilli and garlic paste along with rest of the ingredients. Give it to a good mix. Add water little by little and keep kneading to make the dough soft. Cover with a damp cloth and rest it for half an hour. Make medium size balls of the dough. Dust the dough ball with some flour and then start rolling the paratha. Heat a tawa and place the roti on it . Wait for few seconds, you will notice few tiny bubbles on the surface. Flip the paratha. Cook the other side for a few seconds. Then apply oil and flip it again. Cook it by pressing it very gently using spatula. Cook until it turns brown. Serve methi paratha hot with pickle and curd. Appalu is the main neivedyam for lord hanuman. It has a crunchy outer layer and soft smooth inside. Heat a heavy bottom pan with 1 1/2 cups of water. Add grated jaggery and ghee, boil till the jaggery melts . Add bombay rava slowly and keep stirring. Make sure there are no lumps. Cover and cook for 2 to 3 minutes. Open the lid, mix well and cook on low flame while stirring. Turn off the flame and allow it to cool down. The flour mixture should not be too hard or too soft. You should be able to make a round patty with the mixture. Heat oil in a pan for deep frying. Grease your palms with ghee, make small lemon sized balls and keep it side. Once the oil is heated up, keep it in medium flame and shape the lemon size balls by pressing with palms into round shape patties..
Fry in oil till it becomes golden brown in colour. Fry equally on both sides . Once the appalu are done, place them on a tissue paper. Serve as neivedyam. Do not over crowd the pan as they tend to stick with each other and break . 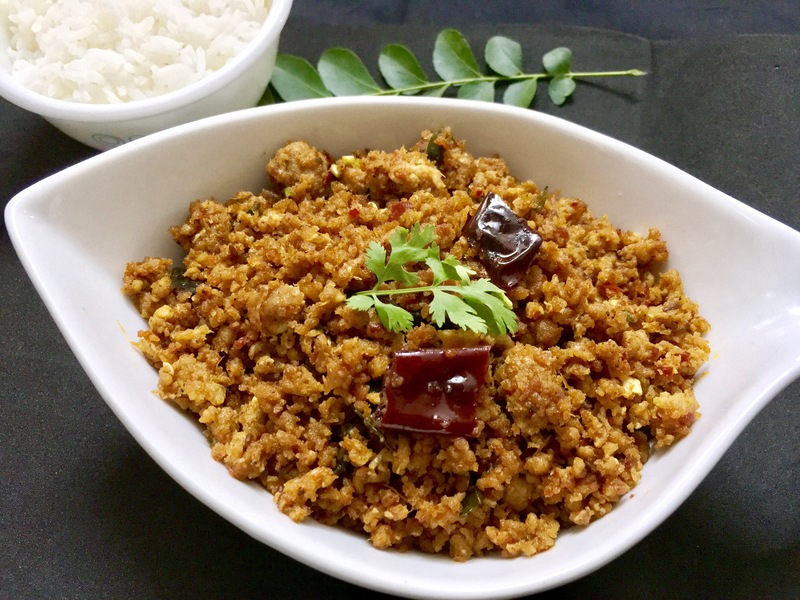 Pulagam is an Indian traditional dish made with rice and dal. It is also prepared as naivedyam during every festival. Wash rice and moong dal together. Put rice and moong dal together in a small pan with 2 1/2 cups of water. Bring it to boil, add salt and turmeric powder. Cook on low flame till the water is completely absorbed and rice is cooked. Switch off the flame and add 1 tsp of ghee. Put jaggery pieces on top of the rice. Serve as naivedyam to god. Wash rice several times and soak it in enough water for 15 to 20 minutes. Drain and keep it aside. Pour milk to a rinsed heavy bottom pot. Bring it to a boil on a medium flame. To the boiling milk, add drained rice and stir. Stir once every few minutes. Cook the rice till it turns mushy and soft. Adjust the consistency of the payasam by adding more milk. Let the rice and milk bubble up after adding milk. Turn off the stove. Add grated Jaggery and 1 tsp of ghee mix well. Stir well until dissolved. Heat ghee in another pan. Fry cashew nuts till they turn light golden in colour. Add raisins. Stir till they swell and pour this into the rice payasam. Serve rice payasam warm or cold. Grind all the above ingredients into a fine paste using little water. Wash the chicken and put it in the pressure cooker. Grind all the masala ingredients to a fine paste using little water. Transfer the masala paste into the chicken. Add salt, red chilli powder, turmeric powder and 1/2 cup of water. Mix well. Pressure cook the chicken for 3 to 4 whistles and turn off the flame. Wait for the pressure to release naturally. Keep it aside. Heat oil in a wide pan. Add all the talimpu ingredients one by one. Fry till the curry leaves turn crisp and aromatic. Add sliced onions, turmeric powder and a pinch of salt. Cover and cook on medium flame till the onions light golden brown. Now add the cooked chicken along with any left over gravy and cook on high flame. Let the water evaporate. Mix well and adjust seasoning. Roast the chicken on medium flame for 5 to 6 minutes. Scrape the sides and bottom of the pan now and then. When the chicken turns light brown in colour, add finely chopped coriander and mix throughly. Fry for another 2 to 3 minutes. Check out the seasonings. Switch off the flame and serve hot. In a pan, put 1 1/2 cups of water bring it to a boil. Add grated jaggery and 1/3 tsp of ghee. Let the jaggery melt into water. Add rice flour and keep stirring until it forms a smooth dough. Swicth off the flame. Keep it covered for 5 minutes. Let it cool. Open the lid and knead the dough until it forms a smooth dough. Take half a portion of dough. Make very small balls with the dough by greasing your hands with some ghee. Keep them aside. Dilute remaning dough with 1/2 cup of water and keep it aside. Take 2 1/2 cups of milk in another pan and bring it to boil. When the milk starts to boil, add the prepared rice balls slowly. Give it a stir carefully with out crushing the undrallu. Let them cook with milk on low flame for about 10 minutes. After 10 minutes you will notice that the balls are soft and floating on top. Add the diluted flour mix. Mix well. Cook for 1 to 2 minutes and switch off the flame. Wait for a minute and add grated jaggery. Gently mix it well until the jaggery is well combined. Transfer this into a bowl, offer this as naivedyam or prasadam to Lord Ganesha on Ganesh Chaturthi . Wash basmati rice and soak in water for 20 minutes. Drain and keep it aside. Wash all the finely chopped leafy vegetables and keep it aside. Heat oil and 1 tbsp of ghee in a pan. Add garlic cloves, cinnamon, cardamom and star anise. Fry for 1 to 2 minutes, add ginger garlic paste. Fry till the raw smell fades away. Add 2 1/2 cups of water and salt. Let it boil. Add finely chopped methi leaves, mint leaves and coriander leaves. Mix well and let it boil again. Add drained basmati rice. Mix well. Cook on medium flame. Make sure the rice is fully cooked. Once cooked, keep it covered for 5-6 minutes. Lastly, add the remaining ghee. Mix throughly and serve hot with any type of gravy curries. Adjust the water quantity according to your wish. Wash and soak tamarind in hot water for some time. Squeeze and pass it through a filter, discard stones and pulp. Keep it aside . Wash and cook rice with 3 cups of water. Do not make the rice mushy. Cool the rice in a wide plate. In a motar pestle, crush mustard seeds into a powder. Heat oil in a pan. Add peanuts and fry for a minute. Add chana dal and urad dal. Fry till light golden colour. Then add mustard seeds, broken red chillies, green chillies, crushed ginger and curry leaves. Fry till the red chillies turn crisp. Add salt and tamarind juice or paste. If you are using tamarind paste add 2 to 3 tbsp of water and cook. Cook till the mixture thickens other wise pulihora will be very moist. It will be a thick but flowing paste. Remove from heat. Add the cooked tamarind mix and combine well such that its spread all over the rice. Finally sprinkle mustard seeds powder. Mix well. Adjust salt. Do not mix while the rice is hot. Another version is to replace mustard powder with a 1 tsp of roasted sesame seeds powder. Wash the atukulu well and drain for 5 minutes. Powder the jaggery with out lumps. Take a bowl and mix the drained atukulu and jaggery. Sprinkle 1 1/2 tsp of milk and mix well . Remove to a serving bowl. Offer as neivedhyam for krishnashtami. Grind jaggery in a mixer to a fine paste or powder. Take a bowl, add all the ingredients. Mix well and roll it into a small round shaped ball. Repeat the same with the rest of the mixture. Chalimidi is ready to be offered as naivedhyam to the diety. To make home made rice flour, soak 1 cup of rice grains in water over night. Next day, drain water and dry the rice on a cloth for 20 to 30 minutes. Grind the rice to a fine powder. Use whenever required. Wash rice and cook with 2 1/2 cups of water . Lightly mash it with a potato masher. Bring rice to room temperature. Mix cooked rice with curd and salt. Add finely chopped coriander leaves. Mix throughly and keep it aside. Heat oil in a pan, add mustard seeds. Let them crackle for a few seconds and then add cumin seeds. Let it fry for 5 seconds. Add crushed ginger and green chillies. Fry for 10 seconds. Add turmeric powder, broken red chillies and curry leaves. Fry till curry leaves turns crisp. Turn off the flame. Add the talimpu ingredients to the prepared curd rice mixture and mix well. Take a bowl, add dosa batter and add all the remaning ingredients except oil. Mix throughly. Heat ponganalu pan and add 3 to 4 drops of oil in each mould of the pan. Once the ponganalu pan is hot, pour the batter into each mould to 2/3 and cover with lid. Add some more oil on the top and close the lid and cook on low-medium heat. When the base turns golden, flip them and cook them until done. Serve with chutney of your choice. Cook on low medium heat, if not you will end up having raw batter in the middle . You can add finely chopped vegetables like carrot, capsicum, cabbage and tomatoes. Heat oil in a pan. Add corn kernels and fry on medium flame for 2 minutes . Then add salt and mix well. Fry for another 3 to 4 minutes. You can also use sweet corn. Adjust the quantity of chilli powder and pulav masala as per your taste. Feel free to experiment with whatever seasonings you may have at hand. In a bowl, add mayonnaise, crushed garlic, tobasco sauce, lemon juice and salt. Mix throughly. Cover and refrigerate for at least 30 minutes. Garnish with red chilli flakes just before serving. Goes well with chips and nachos. Combine all the ingredients in a mixer and blend to a smooth paste using oil . Refrigerate and use as required. Adjust the amount of oil based on the consistency you are looking for. The chutney can be used with snacks like sandwiches, and chats. Heat oil in a pan. Add green chillies and fry for a minute. Add coriander seeds, chana dal, urad dal and cumin seeds. Fry on low flame till they become light golden in colour. Lastly add crushed garlic, roasted chana dal and curry leaves. Mix well and swicth off the flame. Put all the fried ingredients in a grinder jar. Add salt and grind it to a coarse powder. Then add freshly grated coconut and curd and grind it to a paste. Lastly add coriander leaves and grind for one more time. Empty it into a bowl. For talimpu, heat oil in a pan and add mustard seeds and cumin seeds. When they start to splutter, add red chillies and curry leaves. When curry leaves turn crisp, switch off the flame and pour it on the already grinded chutney. Mix well. You can adjust coconut and curd according to your taste. With a masher, mash the cooked rice and keep it aside. Add curd and milk to the rice. Mix well and break lumps if any. You can either use a spoon or your hands while breaking the lumps. Heat oil in a pan, add chana dal and urad dal, fry for few seconds. Add mustard seeds, cumin seeds and black pepper corns. Once the mustard seeds start to crackle, add finely chopped ginger and green chillies . Fry for a few seconds and add broken red chillies and curry leaves. When the curry leaves turn crisp, add asafoetida and turn off the stove. Pour the talimpu over the curd rice and mix well. Add coriander leaves and salt to the curd rice, mix well. Serve cold. The rice has to be more soft than what we cook on a daily basis. Serve curd rice topped with few coriander leaves and pomogranate arils. You can skip the fruit. Wash basmathi rice 2 to 3 times in water to remove excess starch. Soak them for 30 minutes. After 30 minutes, drain all the water. Heat ghee and oil in a pan. Add cloves, cinnamon, cardamom and bay leaves and saute for few seconds. Add sliced onions and green chillies and saute till they become transparent. Add ginger garlic paste and saute on medium flame till the raw smell goes away. Add salt and 2 cups of water. Stir well. When the water starts boiling, add drained rice and mix well. Taste the water. It must be slightly salty. Cook on low flame until the water is absorbed. Switch off the flame. After 5 to 6 minutes, open the lid and mix it slowly. Serve hot. Ghee rice can be served along with gravy type curries. Wash the chicken meat and put it in a pressure cooker and add salt, red chilli powder, turmeric powder, ginger garlic paste, onion paste, pulav masala and water. Mix well and cover and cook for 6 to 7 whistles. Let the pressure release naturally. Open the lid and check if the chicken is cooked properly. If there is any water left, cook for another 2 to 3 minutes till the water dries out. Let the chicken pieces cool. Then shred the chicken pieces and remove the bones. Heat oil in a wide pan, add crushed garlic and fry for a second. Then add cumin seeds, broken red chillies and curry leaves. Fry till the cumin seeds turn into a light golden brown colour. Immediately add onion paste, salt and turmeric powder. Mix well. Fry for 1 minute, then add pulav masala and coriander powder. Mix well. Add the shredded chicken and roast well. Scrape the sides and bottom of the pan now and then. Add some more curry leaves. Mix throughly. Once the chicken turns little crispy, add finely chopped coriander leaves. Mix well. Check out the seasoning. Serve hot. Dont forget to scrape the sides and bottom of the pan after roasting, the remains will be very flavorful and tasty. This recipe was given to me by my sister who is an amazing cook as well. Wash and soak korralu for 2 hours. Boil with 2 cups of water and 2 drops of oil. Cool it on a wide plate. In a mortar pestle, crush ginger and green chillies to a paste. Heat ghee in a large pan. Add cumin seeds, mustard seeds and fry for a few seconds. Add urad dal and cashew nuts. Fry till it becomes light golden colour. Then add red chillies and curry leaves and fry for 2 to 3 seconds. Add ginger and green chillies paste. Fry till the raw smell goes out. Add freshly grated coconut and salt and fry for 2 minutes. Add the cooked korralu and mix well. Fry for 2 to 3 minutes. Garnish with finely chopped coriander leaves and serve . Foxtail millet may be replaced with kodo millet (arikalu), little millet (saamalu), barnyard millet (oodalu) and proso millet (varigalu). Adjust grated coconut according to your taste. Put all the ingredients into a grinder jar and grind it to a fine paste. Heat oil in a pan, add mustard seeds. When mustard seeds starts spluttering, add cumin seeds and fry for a second . Add all the remaining ingredients one by one and fry till they become light golden brown. Transfer the grinded mixture into the talimpu pan, mix well. Switch off the flame. Adjust your spiceness according to your taste. Goes well with idly and pesarattu. You can use tamarind paste instead of grated mango. Put all the ingredients into a blender. Blend to a coarse paste. Do not grind into a smooth paste. Goes well with bonda and bajji. You can also use chintakaya pachadi or avakaya instead of magaya. Pappulusu is a simple stew made with toor dal. It is a staple in andhra homes and can be considered a spice less version of sambhar. In a pressure cooker, add mashed dal. Add all the remaning ingredients expect butter. Add 3 cups of water and bring to boil. Then add butter. Check out the seasonings. Close the lid, cook on high flame for up to 2 whistles. Reduce flame and cook for 4 to 5 minutes. Switch off the flame. Allow the pressure cooker to cool down on its own. Open the lid and mix thoroughly. Check out the pappulusu. If pappulusu is thick add more water. Talimpu: Pre heat oil and ghee in a pan. Add garlic and fry for few seconds. Add mustard seeds and fry for few seconds. Then add cumin seeds, fenugreek seeds. Let it fry for a few seconds. Add red chillies and sambhar powder. Fry for 1 to 2 seconds. Immediately, add curry leaves. Pour the boiled dal mixture into the talimpu and cover it for few seconds. Remove the cover, add finely chopped coriander leaves. Simmer for 4 to 5 minutes and turn off the heat. Keep covered until served. Serve hot with hot steamed rice with vadiyalu or appadam. Wash and soak rice for 30 minutes. Cook with 3 cups of water, oil and salt. Dont cook the rice too much. It will spoil the texture of the pulao. Transfer the rice to a wide plate, cool it completely. Heat ghee/oil in a pan, add cumin seeds and saute till they begin to crackle. Add onions, fry them until they turn translucent. Add ginger garlic paste, turmeric powder and salt, fry till a nice aroma emanates your kitchen. Next, add tomato puree. Mix and cook on high heat for 2 to 3 minutes or till the mixture thickens. Add chopped tomatoes, mix and cook for 2 minutes. Add capsicum and green peas, mix and cook for 2 minutes. Add red chilli paste and pav baji masala, stir and cook on medium heat for 2 to 3 minutes. Add rice and mix gently. Add lemon juice and finely chopped coriander leaves. Mix well. Serve hot with yogurt. Adjust seasonings according to your taste. A quick snack of puffed rice sold around parks, play grounds and road side. Mix all the ingredients together in a bowl. Serve immediately in individual cones before the mixture becomes soggy. Garnish bhel with chopped coriander leaves and chopped onions. The salt and spice powders can be adjusted as per your taste. Wash and soak chana dal in water for 30 minutes. Take a pan and add water. Add chana dal and bring it to a boil. Boil for 2-3 minutes. Add freshly grated coconut and salt. Mix well. Reduce the heat, add rava slowly into the boiling water, mixing well with another hand to prevent lumps. Cover the pan with a lid until the water evaporates completely. Make sure it doesn’t burn. Swicth off the flame. Leave it covered for about 15 minutes. Transfer this to a wide plate and cool. After 15 minutes, wet ur hands and make small balls. Sprinkle some water if rava is too hard. Use an idli steaming stand or any perforted plate to steam these rice balls. Place rice balls on the plate. Adjust water according to the rice rava you are using. If you have any doubt, add an extra half cup of water. Rinse rice with water. Add water and soak for 15 minutes. Drain it compleately in a colander. Heat ghee and oil in a pot. Saute bay leaf, cloves, cinnamon and cardamom until they begin to sizzle. Add cumin seeds and shajeera on a low flame until they get roasted well. Add ginger garlic paste and fry until raw smell goes away. Transfer drained rice to the pot and roast for 1 to 2 minutes. This helps to bring out the aroma. Pour 2 cups of water and add salt. Stir well and taste the water. It must be slightly salty. Bring water to a boil and cook on medium heat until the water is absorbed. Switch off the flame. After 5 to 6 minutes, open the lid and mix it slowly. Serve with any curry. Do not over mix the rice. In a mixing bowl, add ragi flour, rice flour, bombay rava and salt. Mix all the ingredients with a cup of water and curd. Make sure there are no lumps. Add chopped onions, ginger and green chillies. Sprinkle 1/2 or 1 tsp of oil. Cook on medium flame. Let the base turn crispy and golden brown in colour. No need to roast on the other side. The dosa has to be served immediately. You can add grated carrot to the batter. Make sure to stir the batter before pouring the dosa on the tava. This recipe has been given to me by my sister. Wash korralu two to three times. Pressure cook it with two cups of water on medium or low flame for 4 to 5 whistles. Meanwhile, take a pan and add one tsp of ghee and fry the nuts and raisins until they turn golden. Remove from heat and set aside. Once the pressure subsides on the cooker, open the lid and add milk. Mix well. Add cardamom powder. Cook on low flame for 4 to 5 minutes. Add more milk if you want the payasam to be thin. Turn off the heat and add jaggery, ghee, nuts and raisins. Mix well. Adjust seasoning. In a mixing bowl, add rice flour, bombay rawa, maida and salt. Add water to adjust the consistency of the batter. The consistency of the batter should be thin(watery). Keep it aside for 30 minutes. Pour the batter on the tawa from the edges towards the center. Sprinkle 1/2 or 1 tsp of oil. Cook on medium flame. Let the base turn crispy and golden brown in colour. No need to roast on the other side. The dosa has to be served immediately. You can add cumin seeds and curry leaves. Make sure to stir the batter before pouring the dosa on the tawa. Take a bowl. Except oil, combine all the ingredients well and make a batter. Rest for 10 to 15 minutes or till the rava turns soft. Take the bread slices. Spread the rava mixture evenly with a spoon. Heat a frying pan and drizzle oil. Place the bread with filling facing down on the pan. Cook for a few minutes on medium flame till the mixture gets light brown. Drizzle some oil on top. Then flip the bread and cook the other side as well. It should be brown, crispy and toasted. Remember to keep the flame on medium or low to get the perfect crisp bread. Remove onto a plate and cut into half. Serve hot. Take a small grinder jar. Put grated coconut, green chillies, coriander leaves, salt and curd. Grind to a coarse paste. Check out the seasoning. Keep it aside. Heat oil in a small pan, add mustard seeds. When the mustard seeds begin to splutter, add garlic, urad dal and cumin seeds. Fry till the urad dal becomes golden brown. Then add red chillies and curry leaves. Fry till the curry leaves become crisp. Swicth off the flame and immediately pour the talimpu on the coconut chutney. Goes well with idli and dosa. Rinse baby potatoes well to get rid of the dirt. Pressure cook for 2 to 3 whistles. Peel of the skin and keep it aside. Heat oil in a wide pan, add all the talimpu ingredients one by one and fry for 30 seconds . Now add sliced onion, turmeric powder and salt. Mix well. Cook on medium flame. Saute till the onions turn transulent. Add the peeled potatoes and stir them well. Now add curry powder and red chilli powder. Mix well so that they coat the potatoes evenly. Check out the seasoning and stir again. Saute the baby potatoes for 4 to 5 minutes on low flame. Then add chopped coriander leaves. Stir and swicth off the flame. The number of whistles in cooker depends on the size of small potatoes and also your cooker. Adjust accordingly. You can use sambhar powder instead of curry powder. Before you begin, take sesame seeds in a plate. Remove stones if found. Grate jaggery and keep it aside. Dry roast sesame seeds in a heavy bottomed pan till the rawness disappears and a nutty aroma emanates the kitchen. Roast on low flame. Remove onto a wide plate and allow it to cool. Blend the sesame seeds for 5 to 6 seconds. You have to make a coarse powder of the sesame seeds. Add the grated jaggery and blend till combined. Make small balls with this mixture. Store in an air tight box. If the mixture has crumbled, mix 1 tbsp of milk to make laddus. Heat oil and ghee in a kadai. Add garlic cloves and fry for 2 minutes on medium flame. Add cubed potatoes and carrots. Cover and cook for 3minutes. Add cumin seeds, red chillies, onions, green chilles and curry leaves. Cover and cook till onions and potatoes are cooked well. Add ginger garlic paste, turmeric powder and salt. Mix well. Fry till the raw smell fades away. Add rice rawa. Mix well. Fry for 2 to 3 minutes and then add the pulav masala. Mix thoroughly. Pour water. Cover and cook on low flame till the water dries up. If rawa is not cooked properly, sprinkle some water and cover. Let it cook for 3 to 4 minutes. You can use vegetables of your choice. This recipe has been handed down to me by my mother in law. Clean the spinach leaves and chop it finely. Wash them 2 to 3 times and strain. Wash toor dal and keep it aside. Take a pressure cooker, add dal, spinach, green chillies, tomatoes and onions. Add 2 1/2 cups of water. Pressure cook for 5 to 6 whistles. Let it cook until spinach and toor dal is completely soft. Allow it to release the pressure. Open the lid and add turmeric powder, salt and red chilli powder. Heat oil and ghee in a pan. Add urad dal and fry for 15 seconds. Add all the remaning talimpu ingredients one by one along with crushed garlic . Fry for 30 seconds. Put the cooked dal in it. Cover and cook for one minute. Remove cover. Adjust the consistecy of dal with remaning 1/2 cup of water and boil for 5 to 6 minutes. Add lemon juice and mix well. Adjust seasoning. Serve hot with boiled rice and potato chips. You can use moong dal instead of toor dal with chukka koora. Wash the fish pieces well under running water. Apply some salt and turmeric to the fish pieces and rest it for a few minutes. Wash the fish again and add lemon juice if there is any unwanted smell. In a bowl, add ginger garlic paste, lemon juice, red chilli powder, coriander powder, besan powder, pulav masala and salt as per taste . Mix all the spices well using 1 tbsp of oil. Coat the fish with the masala paste. Marinate for one hour. Take a pan. Add 3 to 4 tbsp of oil and heat it. Place the fish pieces carefully on the pan and cook them for 5 to 6 minutes on one side. Flip the fish pieces and cook for 5 to 6 minutes. Once the fish is well cooked, place them on absorbent paper to remove excess oil. Similarly, fry the rest of the pieces. Sprinkle lemon juice while serving the fish. Make sure to fry both the sides well until fish turns golden red and crisp. This recipe has been handed down to me by my mother. Perfect for Idlis. A dollop of ghee will greatly enhance its taste. Dry roast coriander seeds until light brown. Repeat the same process with chana dal, urad dal and cumin seeds. Heat 1 1/2 tsp of oil and fry the broken red chillies until light brown. Let it cool. Repeat the same procedure with crushed garlic and continue to fry until the raw smell fades away. Lastly add tamarind and switch off the flame. Heat another 1 1/2 tsp of oil and fry curry leaves until crisp. Cool down all the ingredients. Start by grinding the chana dal, urad dal and cumin seeds to a coarse powder and put it aside. Next, grind the coriander and put it aside. Grind red chillies, curry leaves and tamarind. Now mix all the grinded ingredients together with salt. Grind garlic, coriander seeds and cumin seeds into a fine paste. Heat oil in a pan add all talimpu ingredients one by one. Fry for a minute. Add soaked fenugreek seeds and fry for 3 to 4 minutes. Add finely chopped onions and green chillies. Mix well. Add turmeric powder and salt. Cover and cook on low flame till the onions become soft. Add red chilli powder and tamarind paste. Mix well. Grind all the masala paste ingredients together. Add one cup of water. Bring to a boil and then add the grinded masala paste. Mix well. Cover and cook on medium flame for 8-10 minutes. You can also add jaggery while adding the tamarind paste. Wash the boneless chicken cubes. 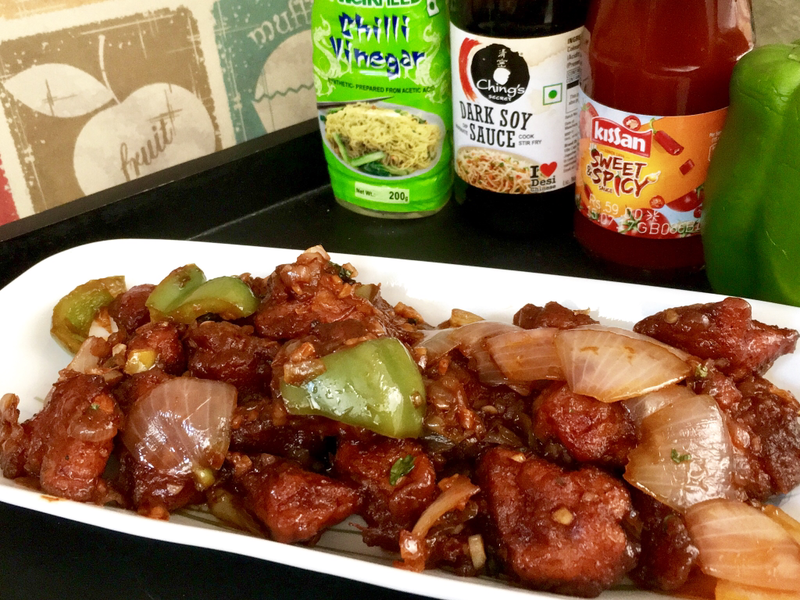 Marinate with ginger garlic paste and green chillies. Mix well keep it aside. Heat a pan with oil or ghee. Add cloves, cinnamon and Cardamom. Fry for one to 2 minutes. Add onion paste fry on low flame till raw smell goes. Add marinated chicken to the onion paste. Fry on high flame for about 5to 6 minutes . Add turmeric powder,salt and chilli powder. Cover and cook for 3 to 4 minutes on medium flame. Add grinded masala paste add 1/2 cup of water . Cover and cook till chicken becomes tender. Lastly add chopped coriander leaves and Cardamom powder. Mix well . Goes well with biryani rice and roti’s. Heat 1 1/2 tbsp of oil in a pan . Add Chana Dal, coriander seeds,urad dal ,cumin seeds, and mustard seeds fry on medium flame for 1 minute. Add crushed garlic and broken red chilles. Fry till they turn crispy . Cool them. In the same pan , add 1 1/2 tbsp oil fry curry leaves till crispy . Cool them . Grind every thing together with salt ,tamarind paste and jaggery using little water to a coarse paste. You can store this pachadi for about a week in the refrigerator. Adjust seasonings. Take a large bowl,add Bengal gram flour,rice flour,red chilli powder,carom seeds ,salt and mix well. Add water and make a non-sticky dough. Heat oil in a frying pan. Oil should be moderately hot. Grease the mould with oil .Fill the dough in the mould . Now hold the sev maker over the frying pan. Press the handle, as the dough starts to fall slowly move the sev maker in circular motion to make a circle . Fry both the sides. Make sure it turns to light golden brown, in colour . Remove it using slotted spoon and place it over paper napkin to remove excess oil .continue the same process for remaining dough. In the same oil, deep fry curry leaves until crisp. Keep it aside.Let the sev cool completely . Break sev and curry leaves lightly with your hands . Mix well . The sev is ready to serve. Heat oil in a pressure cooker. Add onion paste fry on medium flame for 5 minutes. Add turmeric and salt and fry for another3 minutes. Add ginger garlic paste and add red chilli powder mix well. Add washed mutton mix well. Cook on low flame for 5 to 6 minutes. Add clove powder and pulav masala . Mix throughly . Fry for 8 to 10 minutes on medium flame add 1 1/2 cup of water and put the lid on. Cook on high flame for 2 to 3 wishles . Lower the heat cook on low flame for 5 to 6 minutes. Switch off the flame, let the pressure release naturally. Once the pressure is realesed open the lid. Check out whether mutton is cooked properly or not. For tempering , take a wide kadai heat oil . Add crushed garlic fry for 30 seconds . Add cumin seeds, red chilli pieces,and curry leaves mix well . Add pulav masala and cooked mutton to this .Immediately cover the kadai with lid for one minute. Remove the lid .Cook on low flame till oil starts to float on top. Adjust seasoning. Add curd and mix again . Dough should be loose consistency. At this stage ,if you want to add more curd add it ,and mix well . Keep it aside. Take a nonstick tawa and drizzle 1/4 tsp of oil,take a small size dough and press it over the tawa with your hands till it gets even. Pour few drops of oil around the dosa. Fry on low or medium heat till bottom side turns to golden brown. You can use any vegetables of your choice expect okra . Water as required to prepare smooth batter. In a large bowl mix together maida,corn flour,salt , red chilli powder,black pepper , egg white and soy sauce. Give a good mix. Now add little water and mix well. Make a smooth batter. The batter should be of dropping consistency. Dip each chicken piece into the batter. Coat them well and deep fry. Flip over and fry till they turn light golden brown and crispy. Drain the fried chicken on a kitchen paper towel to remove execess oil. In a large kadai, add 3 tbsp of oil. Add chopped onion and saute for a minute. Now add chopped ginger and garlic. Saute for a minute, add green chilles, capsicum and diced onion. Add soya sauce and vinegar ,give a good stir and cook for minute. Now add the deep fried chicken and give a good stir and cook for a minute. Coat the chicken pieces well with sauce. Serve hot . Serve hot. Adjust seasoning. You can also add yolk of the egg. Crack eggs into a mixing bowl. Beat with a fork for 1 to 2 minutes lightly. Heat oil in a pan. Once the pan is hot, add crushed garlic and fry for 10 seconds. Add all the remaining tempering ingredients one by one expect Coriander leaves. Fry for a minute. Add onion paste, salt and turmeric. Fry on low flame. Once the onion paste starts to turn light brown, add red chilli powder and pulav masala powder. Mix well. Fry for a minute. Turn the flame down to low, add the whisked eggs to the onion masala. Mix well. Increase flame to high. Stir the egg mixture vigorously to make it into small pieces . Then fry on medium flame till the raw smell fades away. Check out the seasonings. Lastly add finely chopped coriander leaves. Mix well. Goes well with rice, roti and bread. Heat a iron tava or a non stick pan. Spread some oil and wipe that off with a piece of wet cloth. Take one ladle full of batter and pour it on the centre of the pan. Spread immediately into thin round circle. Switch the flame to high and once it is slightly cooked, add one big cube of butter and 1 1/2 tsp of podi. Using a butter knife or a spoon, spread the podi really well. Smear oil when the dosa starts to turn a bit brown. Fold it one side and take out from the pan. 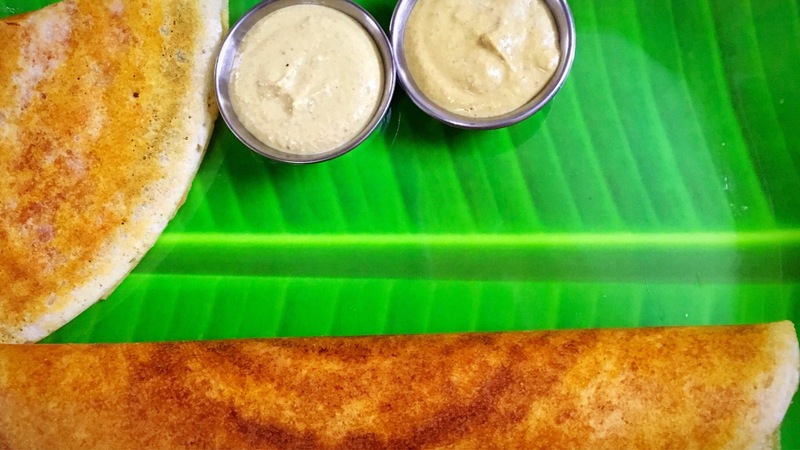 No need to flip this dosa and cook the other side. You could serve with chutney or sambar of your choice. Instead of idli podi you can use nalla karam podi, Gun powder aka kandipappu podi or any other podi of your choice.